To most people, foreclosures seem like something that can only happen to everyone else. 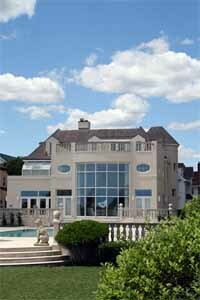 However, some mega-mansion owners have had a reality check as their luxury homes are placed under foreclosure. CNN Money recently showcased eight homes in located in some of America’s wealthiest communities across the country that are now finding themselves in the middle of the housing crisis. Priced at $18 million, the mansion in Laguna Beach, Calif. has never been occupied and offers impressive ocean views, a 20-car garage and 11 acres of land. A Newport, R.I. mansion located at the city’s high point is a restoration from 1891, and has been listed for $7.9 million. Listed for $6.25 million, the Orono, Minn. looks like a home straight out of the Hamptons, but it located on peaceful Lake Minnetonka. Located at one of the highest points in La Jolla, Calif., this mansion home is now listed for $5.9 million. The home’s highlight is the 3,700 square foot master suite with his and her bathrooms. A 2007 home in Cherry Hills Village, Colo. has an asking price of $4.6 million for its 11,000 plus square feet of living space and serene mountain views. The Monterey, Calif. home is located in Monterra Ranch, the area’s exclusive gated community. This home with plenty of spaces for entertainment is priced at $3.99 million. Atlanta, Ga. boasts a $3.7 million home with 22,000 square feet of space and Mediterranean-style architecture. With spacious bedrooms, a fully equipped chef’s kitchen and waterfall, the $3.5 million home in Palm Desert, Calif. is a great bargain. If you’re looking to buy a mansion in one of these great locations across the nation, now is the time. These bargain prices won’t last long, and interest rates are currently at their all time low. For more information on great foreclosure and luxury homes in the Atlanta real estate market, visit Atlanta Real Estate Forum.